"More info on BOMBardier R-179 welding crack prototype cars issue. There are micro cracks on the body, trucks and frames. Production of the prototype cars is halted. There is plan to correct all the issues, testing, quality control, etc. The bad body, trucks and frames will be thrown out. Bombardier discover this issue back in February 2014 and did tell to MTA about the problem. The prototypes are being produce in Bombardier's Canadian factory. "Car assignments: J, M, Z, L, C = 4 car set. ; N, Q = 5 car set. 6 to 12 months delay... good news for R32 & R42 cars?" The SubChat went go to cite Chicago's and the CTA's trouble with the 5000s. 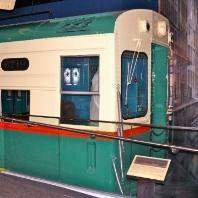 The R32 cars and the PATCO cars, both built by Budd, are the oldest rapid transit cars in service. "One of the reporters mention there is similar issue to CTA 5000 series made by BOMBardier that has cracks." Delivery Completion: July 2017 or January 2018"
"Riders on the C train, who endure the oldest and most battered subway cars in the entire system, will have to continue to do so for longer than planned. "The manufacturer of a new model of subway car that was picked to replace those on the C line has encountered problems with its prototypes. Bombardier discovered cracks in the prototype’s steel undercarriage and walls, Metropolitan Transportation Authority officials said Monday. "The MTA had expected all 300 of the new R179 cars to be delivered by January 2017. That date could now be pushed back between six months and 11 months, officials said. The C train’s current R32 cars, built in 1964 and 1965, break down more often than younger cars." and 1965, break down more often than younger cars." Are these the cars that Mr. Harrison so defends when trying to debate others' view of the 2600s and their battered shape here? Sounds familiar. Blue Line anyone? "Are these the cars that Mr. Harrison so defends"
I have not defended any cars. That type of statement shows you have no understanding what I was trying to accomplish. This topic.... I have not heard one reference to the Mayor's statement how the new "L" cars will effect jobs. Study New York's R-179 situation well. Relate the two. So where where did Bombardier buy the cracked trucks from? Is it more Chinese made junk? Too bad. I wanted to see what they looked and sounded like. ...The prototypes are being produce in Bombardier's Canadian factory. Only for the prototypes right? I heard the cars would be made in Plattsburgh. Looking at the MDBF the R32s in Dec 2010 had 95,395 miles between failures,how many do the 2600 series have? The R179 4 car sets are currently running revenue service on the J and since last week, the C trains. MTA will begin taking in delivery of the 5 car sets and start burn-in testing.